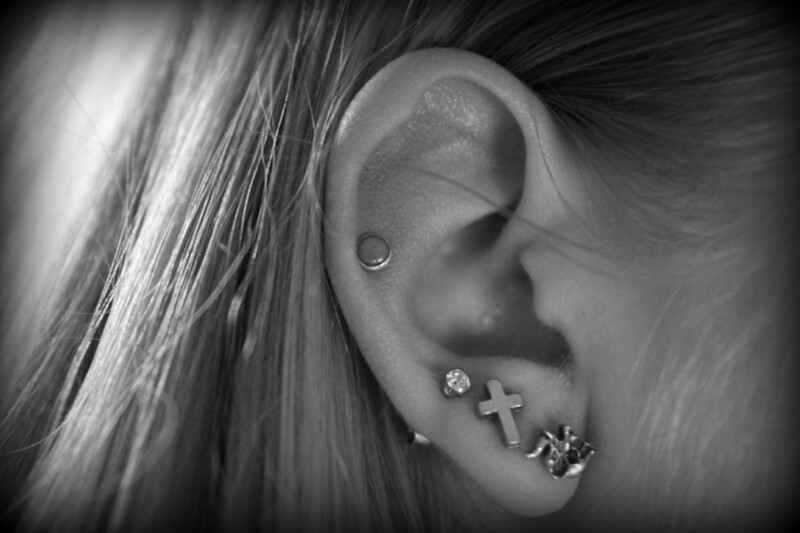 Here is an awesome collection of pictures of ear piercings. Later we have discussed about Different types of ear piercings. Ear Piercing is probably the most accepted and most popular. Earlobes could be pierced in different ways and different earrings are worn. Some are deliberately elongated using bigger earrings for this express purpose. Healing process is relatively easy to deal with considering the location of the piercing. Piercings on body and face have become all the rage in the fashionable world. But the fact is this trend is not new; in fact many tribes and religions have piercings that are part of their culture. Among Hindus it is believed that piercing on ears and nose not only adds to the beauty of the face but also activates reflexology points, though this has not been scientifically proven. Ear piercings are among the most accepted forms of piercings which means that when it comes to picking out what you are going to wear once the piercing is completely healed is simply huge. It does feel good to have a such a huge amount of choice in terms of the type of studs, rings and other ornaments that you can go with. It depends on your tastes, the occasion you are dressing up for as well as your budget. You only have to look at these examples of triple forward helix piercing to know that there is plenty of choices out there indeed. Once you have mulled over all the above points, you can go ahead and enjoy the piercing and all that comes with it. In the Mean while you can have a look over these awesome Pictures of ear piercings. If you are considering getting your ears pierced, then the first logical step would be to look at an ear piercing diagram. This will give you a clear idea about the types of ear piercings and also let you figure out which locations are likely to be an infected ear piercing. While you should definitely go for an ear piercing based on the location that you like, knowing all about ear piercing infection will help you deal with the after care in a more planned manner. This way with the combination of the types of ear piercings and the ear piercing diagram pointing out the locations that are more likely to be affected by activities like combing your hair or wearing hair accessories, you can keep the infected ear piercing clean and safe and lessen the pain too. The thing about getting a piercing is that while people look at the fun aspects of it, they rarely consider the after required for the infected ear piercing. Just learning about the possibilities of types of ear piercings is not enough.